The Universal Recycling Ordinance (URO) supports Austin’s Zero Waste goal by requiring affected property owners to ensure that tenants and employees have access to convenient recycling. By Oct. 1, 2017, all properties will be required to provide recycling services to their tenants and employees. Click to here to determine when your property is affected. Provide recycling for plastics #1 & #2, paper, cardboard, glass, and aluminum. Substitute materials can be proposed on the Annual Recycling Plan. All trash collection service containers (i.e. dumpsters, carts, or compactors) or other collection points (i.e. chutes) should have a recycling container within 25 feet. Recycling service capacity must ≥ 6.4 gallons per dwelling per week. 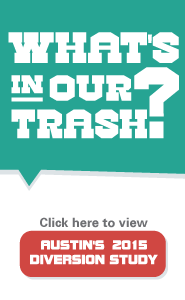 Make sure recycling capacity is equal to or larger than your total on site trash capacity. Recycling capacity can include single-stream dumpster services as well as any other diversion activities (reuse, repurpose, recycled, back-hauled, scrapped, donated, or baled). All signs must indicate recyclable materials accepted, use graphic illustrations, and include both English and Spanish. Educate new employees and tenants within 30 days of hire or move-in and annually thereafter. Submit online each year between Oct. 1 and Feb. 1. Learn more about Organics Diversion requirements and available resources here. 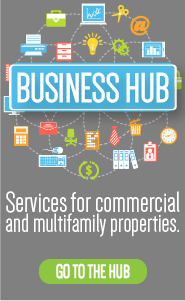 Does your business have a food permit? Click here!